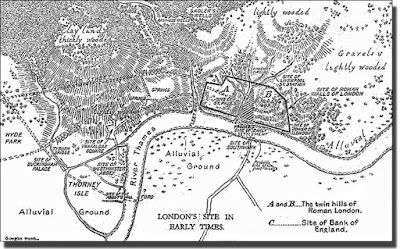 A visitor to London, exploring the City of Westminster, and walking northward along Millbank from Vauxhall Bridge towards Parliament Square, crosses an invisible line, somewhere between Millbank Tower (the tallest building along the route) and Thames House (the headquarters of the domestic security service, MI5), marking the southern edge of Thorney Island. 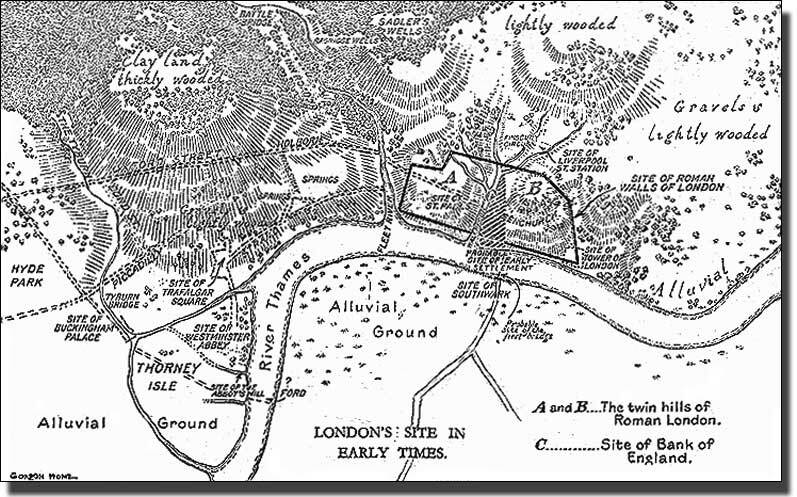 Thorney island was an eyot or ait: an island formed by the deposition of sediments, often at the confluence of two rivers, in this case the Thames and the Tyburn, the latter flowing south from Hampstead through what is now Saint James's Park (archaeologists from the Museum of London have recently been studying the course of the now largely invisible River Tyburn, and the results of their researches can be seen here). Bush Eyot, on the River Thames in Berkshire, gives an impression of what Thorney Island might have looked like before it was built upon. Photo: Nancy (licensed under CCA). 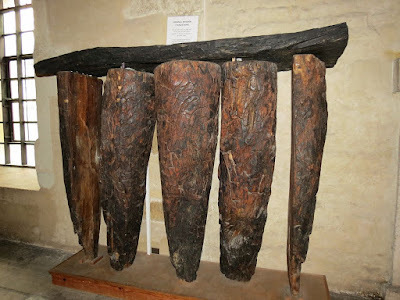 There are records of a church having been built on the island as early as the Seventh Century AD, by Mellitus, Bishop of London, an Italian Benedictine who came to England as part of the mission sent by Pope Gregory the Great, under Saint Augustine, to Christianise the Anglo-Saxon kingdoms. The Palace of Westminster, Parliament Square, and Westminster Abbey all stand on what was once Thorney Island, chosen by the later Anglo-Saxon Kings as the royal centre of London, some distance to the west (and, importantly, upstream) from the bustling (and frequently noisy and malodorous) commercial port and City. 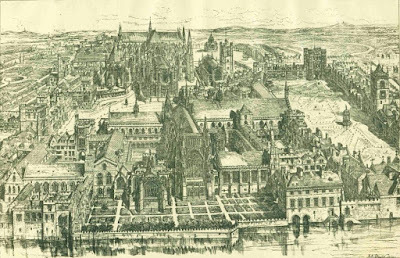 Conjectural reconstruction of Thorney Island in the reign of King Henry VIII, with the Palace of Westminster (foreground), Westminster Hall (centre), Westminster Abbey (top), and Saint Margaret's Church (to the right of the abbey). H.J. Brewer, 1884 (image is in the Public Domain). 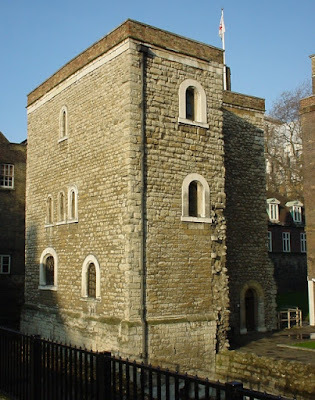 Almost opposite the Sovereign's Entrance to the House of Lords is the Jewel Tower, built in the Fourteenth Century, on the orders of King Edward III. As its name suggests, it was intended to house valuable items of Royal regalia. Its foundations, as revealed by archaeologists, testify to its original position on the shores of a tidal islet, prone to flooding. The Jewel Tower. Photo: lonpicman (licensed under GNU). The foundations of the Jewel Tower, with oak sleepers resting on elm piles. Photo: Tracey and Doug (licensed under CCA). The Palace of Westminster that we see today was built by the Nineteenth Century architects, Charles Barry and Augustus Pugin, following a disastrous fire in 1834. 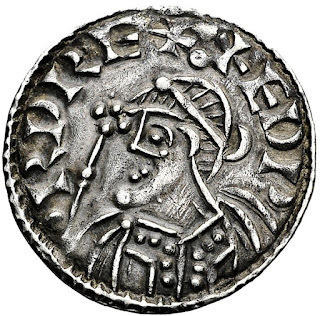 The first palace on the site, however, was built by King Edward the Confessor, in the Eleventh Century, its position on an island presumably providing an element of security. Among the earliest elements to survive is Westminster Hall, built in 1097, and then the largest hall in Europe. Its wooden roof was commissioned by King Richard II, in 1393, from the Royal Carpenter, Hugh Herland. 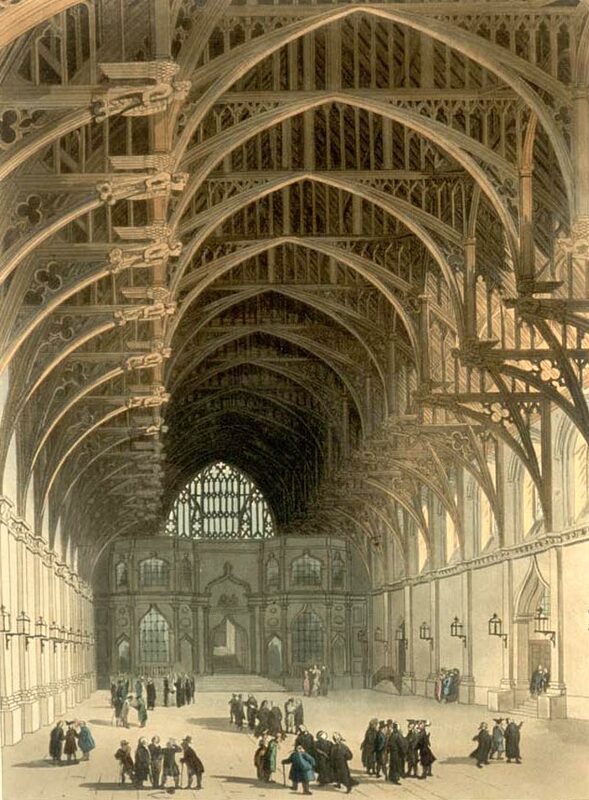 The hall, which saw (among many others) the trials of Sir Thomas More, Guy Fawkes, and King Charles I; together with other parts of the Parliamentary Estate, can be visited by the public when Parliament is in Recess. 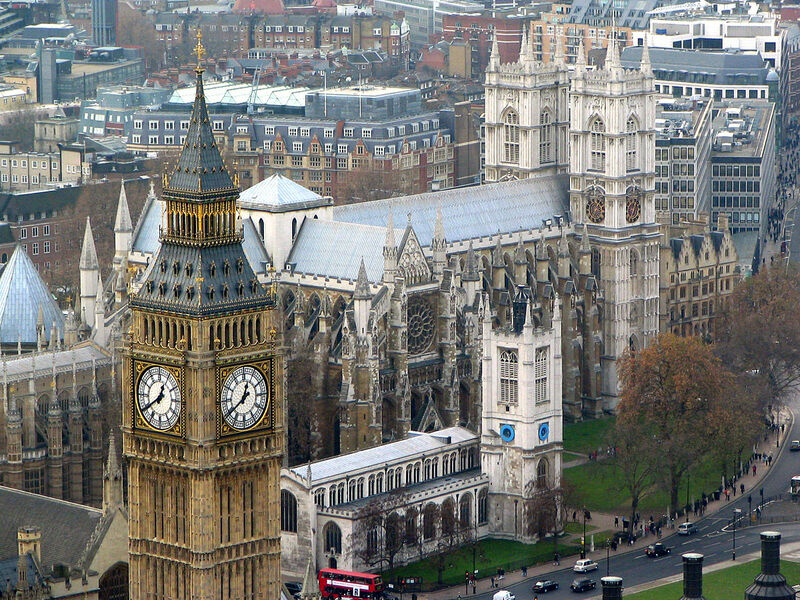 Parliament Square from the London Eye, showing the Elizabeth Tower of the Palace of Westminster (left), Saint Margaret's Church (centre left), and Westminster Abbey (centre). Photo: Tebbetts (image is in the Public Domain). Westminster Hall in 1808, by Thomas Rowlandson & Augustus Pugin (image is in the Public Domain). 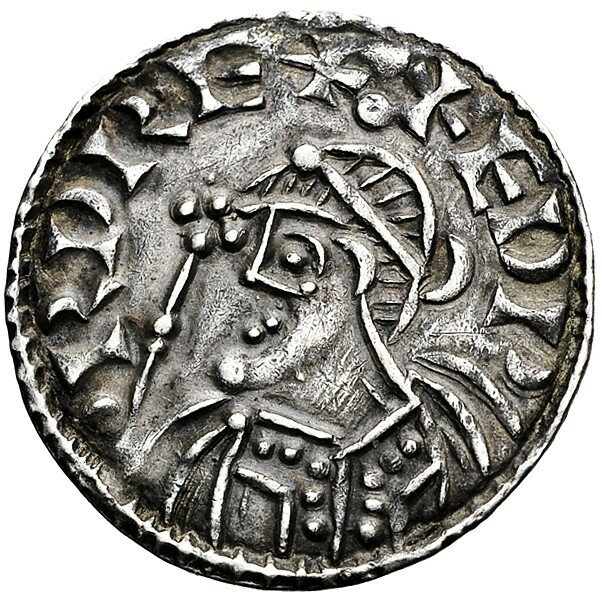 Penny of King Edward the Confessor. Photo: Rasiel Suarez (licensed under CCA). Parliament Square, in its current form, was laid out in 1868. 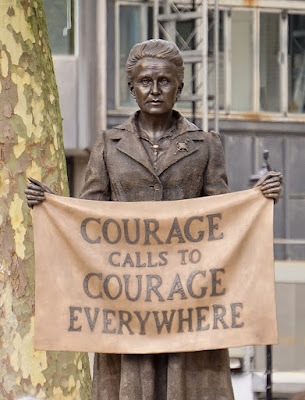 Around it are statues of prominent statesmen (Churchill, Palmerston, Disraeli, Sir George Canning, Sir Robert Peel, Abraham Lincoln, Nelson Mandela, Mahatma Gandhi), and, the most recent addition, the Womens' Suffrage campaigner, Millicent Fawcett. Parliament Square. Photo: wjh31 (image is in the Public Domain). 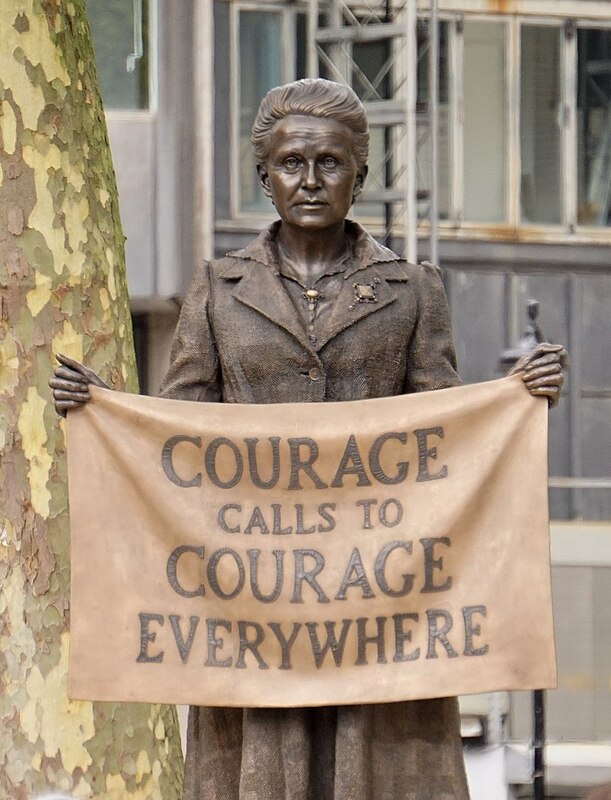 Statue of Millicent Fawcett, Parliament Square. Photo: Garry Knight (licensed under CCA). On the west side of Parliament Square is the Supreme Court, formerly Middlesex Guildhall, built between 1912 and 1913; and, on the south side, Saint Margaret's Church (established in the Twelfth Century but rebuilt in the Sixteenth and Eighteenth Centuries); and Westminster Abbey, the burial place of English monarchs throughout the Middle Ages and into the Early Modern period, and the scene of coronations from the time of William the Conqueror down to the present day. At the same time as he was building the first Royal Palace on Thorney Island, King Edward the Confessor re-modeled the old Benedictine monastery, established by Bishop Mellitus, into a Royal Church, in which he, and his wife, Edith, would ultimately be buried. The number of monks increased dramatically over the following decades, with the "Abbey of Saint Peter" (its official title throughout the Middle Ages) becoming one of the great landowners of England by the time of the Domesday survey of 1087. Much of the City of Westminster is built on land that once belonged to the monks, supplying them with wool and leather for their clothing; meat, cheese, fruit, and vegetables to eat; and milk and ale to drink (the abbey had, by this stage, been taken within the pan-European Cluniac family, whose monks, often with close aristocratic and royal connections, ate and drank very well). The body of King Edward the Confessor being carried to the Abbey of Saint Peter, from the Bayeux Tapestry (image is in the Public Domain). Most of the abbey that we see today dates from the rebuilding that began under King Henry III, in 1245, although each successive generation, including our own, has made its mark on the fabric of the building. The Figures of Twentieth Century Martyrs, above the West Door of Westminster Abbey. Photo: Dnalor_01 (licensed under CCA). I am so grateful to read this and your other posts, while in 'exile' in the US. I lived for years in London, and studied lots of our history, but there is always more to learn. Thank you, Mark.